4 Wheels - Road Tuning. 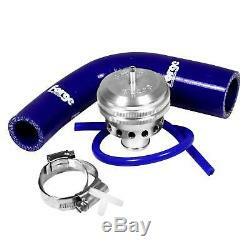 Forge Remote Sited Blow Off / Dump Valve & Blue Hoses For Ford Focus Mk2 ST225. When you come off the throttle on a turbocharged car the built up charge of pressurized air has to go somewhere. If it can't, or if the air isn't released quickly enough then the turbo will slow down or even stall leading to a delay getting back on boost when you get back on the throttle. This is where a dump valve comes in. It releases the built up pressure. Most cars have a valve of some sort these days. This will have been tuned for the factory remap and factory boost levels though. On many cars a soft flexible diaphragm is part of the valve and these wear out. The factory valve will be designed for quietness too. Forge Motorsport offer a wide range of uprated Atmospheric Dump Valves / Blow Off Valves. These are designed to handle additional boost. Because they are atmospheric, they release the charge of air with that distinctive "Whoosh" noise. Each valve is designed to do a very thorough job of releasing pressure, keeping your turbo spinning fast. Releasing to atmosphere rather than recirculating the air should help to keep inlet temperature down (because air coming out of the turbo is warmer than air from outside the engine bay). Forge Motorsport offer properly engineered solutions with most of their products and these are no exception. Many modern engines have problems when you switch from recirculating to vent to atmosphere. Forge have, in most cases, engineered a complete solution to try and get around this. Forge are also offering complete kits for vehicles with ECU controlled valves (many newer VAG cars have this set-up). This means you can enjoy the sporty blow off valve noise on a wider range of cars than ever. For many of us that noise is all part of the fun a of a turbocharged car! These are generally supplied with full instructions. Picture Is For Illustration Purposes Only. Any subsequent orders can be delivered to an alternative address. ORDER NOTES - Due to the automated system we operate, we cannot guarantee to be able to view any notes or comments you add to your order. OVERSEAS ORDERS - Please be aware that we are unable to alter the value or description marked on orders destined overseas for the purposes of avoiding having to pay duty on your order. However, we want you to be confident that if you have any questions or queries regarding any of our listings, our dedicated team of experts are at the other end of a telephone or keyboard waiting to help. Express and guaranteed services will need to be selected and paid for at time of ordering. At JJC, we strive to keep feedback 100% positive. We do this by offering quality products and 1st class customer service. Our customers satisfaction is the most important thing to us at JJC. BOX 2333, Kencourt T/A JJC Race and Rally, Wrexham, LL11 0HB. The item "Forge Remote Sited Blow Off / Dump Valve & Blue Hoses For Ford Focus Mk2 ST225" is in sale since Monday, July 9, 2018. This item is in the category "Vehicle Parts & Accessories\Car Tuning & Styling\Air Intake & Induction\Dump, Bypass & Blow-Off Valves". The seller is "jjcraceandrally" and is located in Wrexham. This item can be shipped worldwide.